It takes quite some effort to equip an AOR AR1500 with a discriminator output. The narrowband FM receiver IC, an MC3372, is located on the bottom of the middle of three printed circuit boards. Some disassembly is necessary before this IC can be reached. The baseband audio can be found at pin 9 of the MC3372. Using desoldering braid, three PCB contacts (blue arrows) are freed from solder. After removing two screws, the middle board can be reached. 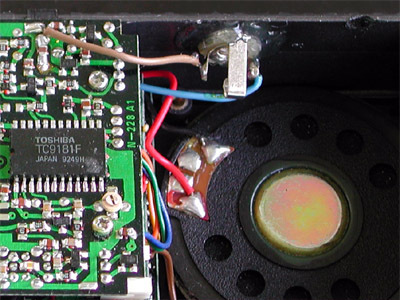 By removing the two PCB spacers, the middle board can be exposed carefully, and te MC3372 at the bottom can be reached. 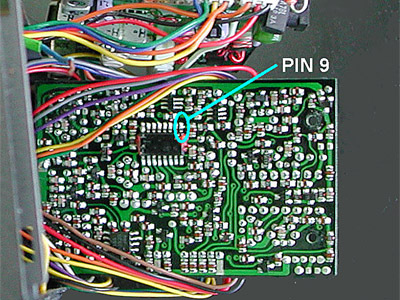 A limiting resistor of 10 k is connected to pin 9. 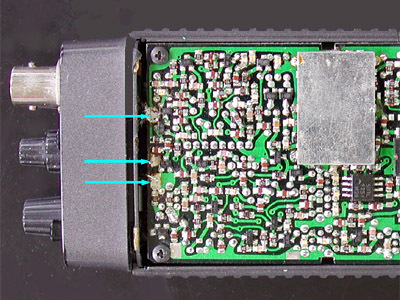 The resistor's other lead is connected to a piece of wire that is guided to the scanner's battery compartment. The resistor is fixed to the IC by a drop of glue from a glue gun. A 3.5 mm mono chassis socket is mounted in the battery compartment. As the rechargeable battery doesn't fill the compartment completely, there is just enough space for the chassis terminal. The wire that runs from the IC (blue) is connected to the 'tip' of the socket. 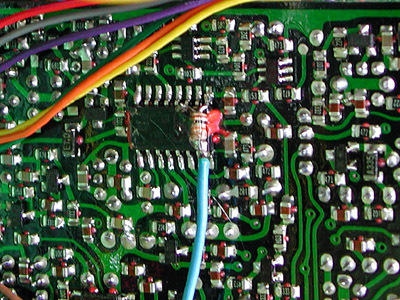 The 'ring' of the socket is connected to a grounded solder pad on the top PCB (brown wire). 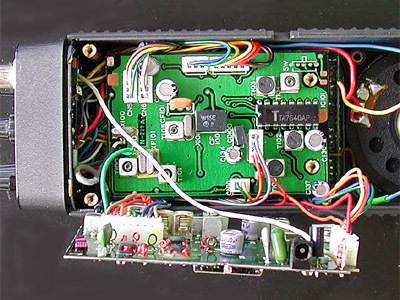 The chassis socket is glued to the scanner with a glue gun. Don't forget to fix the three contacts that were detached earlier.